Paul Quinichette was not styled the Vice-Pres for nothing. Of all the tenor players Lester Young inspired, he passed on the message the most faithfully. He was too often dismissed as an imitator, but Young’s language seemed to be natural to him, so that his flow was not broken up by the fashionable ejaculations necessary to others. 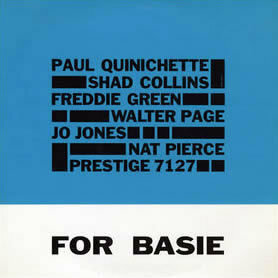 The program of Basie hits perhaps imposed limitations of another kind, but here-in 1957-he was backed by Freddie Green, Walter Page, and Jo Jones, with Nat Pierce happily at the piano. Pierce’s striding on “Texas Shuffle” would certainly have delighted The Chief. Ira Gitler’s good notes from the original LP suggest that this was bassist Page’s last session-a worthy one. Lucky Thompson, at two New York sessions from 1972 and 1973, with Cedar Walton on keyboards, offers a striking contrast to Davis. His style is generally regarded as stemming from that of Don Byas, an Oklahoman, and on tenor it has much of that master’s polish, but his soprano is another matter. Together with wobbly synthesizing, it has a shrill, disembodied quality appropriate to accompanying cartoon ghouls. The iconoclastic Thompson was clearly addressing this set more to musicians than to the people Cobb and Davis favored. Among the eight hits collected in the Gene Ammons set, the walking tempos on “Walkin'” and “Blue Greens and Beans” indicate a special key to his popularity. The music swings almost effortlessly and it is easy to picture a crowded dance floor. The tenors of the period, in fact, seem to have retained a feeling for swinging-as well as their individuality-in a way the trumpet men did not. One wonders how many players like Art Farmer and Idrees Sulieman, both featured here, would be positively identified in a blindfold test?